Not for you, you’ll understand, but for your locos. We all know that the Association recommends we all carry out an annual steam test on our locomotives, to meet the requirements for a Written Scheme of Examination in accordance with our own Boiler Test Code (see our Insurance page) and the Pressure Systems Regulations 2000. That means examining and testing any item that is screwed or bolted on to the Boiler. 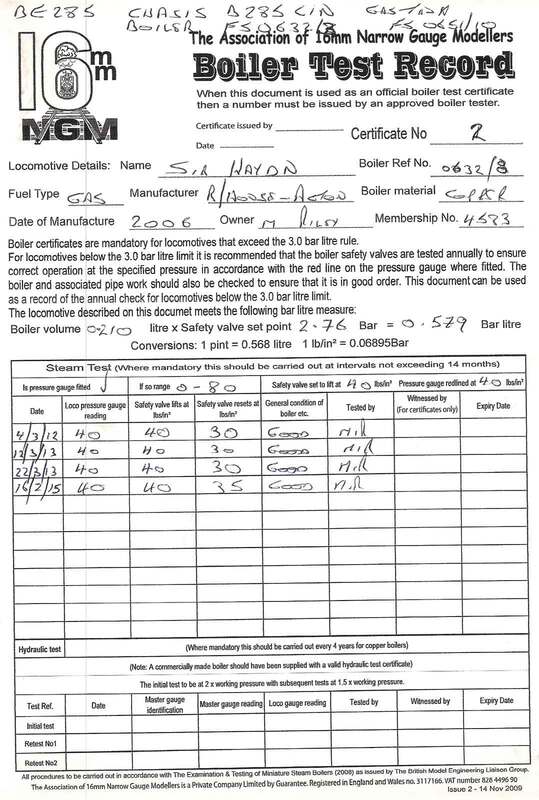 Now before blood pressures reach boiler pressure, this is not the hydraulic witnessed test by an approved boiler inspector, but a simple inspection and test you can perform yourself – or better if carried out by a friend while you test their engines, and most importantly recorded on the handy Association produced Certificate of Annual Inspection and Steam Test to be found at the top of this page. So how do you go about doing it? It’s simple, if it wasn’t I could not do it! 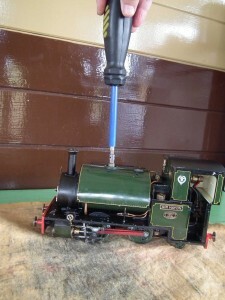 Checking tightness of steam connections. Note: pressure gauge at zero. Is there any sign of leakage? Check there is no visible damage to valves, especially the Safety Valve and the Pressure Gauge: does the Pressure Gauge read zero? Check that any Water Level Gauge is clean and unobstructed. 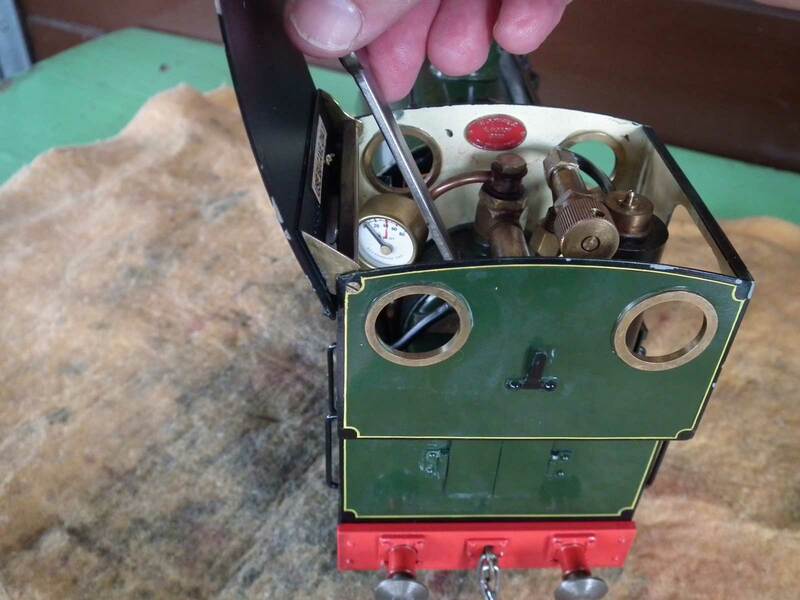 With some Water in the Boiler, make sure the level changes when you tilt the loco. Can you pump water into the Boiler? Now add, oil, water and fuel, and in a safe place (and remember if you are indoors blow away any spilt gas). Light up, and watch as pressure build up: are there and leaks or bubbles from joints? If so, turn off the gas and nip up the offending joint, taking care not to over tighten. If the leak persists, you may need to replace a sealing washer. Relight the engine and continue to watch as it comes up to pressure. 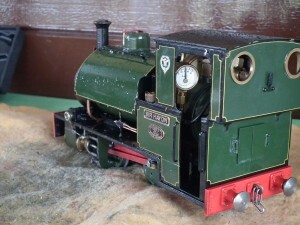 Note the Pressure Gauge reading when the Safety Valve lifts; this should be close to the manufacturer’s designed pressure. Your engine should now blow off at the desired pressure, watch the Pressure Gauge and check with the engine blowing off that the pressure does not exceed 10% over that recommended. (For my locos and the majority, recommended 40 psi plus 10% = 44psi.) If it does, you may need to remove the Safety Valve, strip it down, clean, reassemble and reset it against a known standard. Check again for any leaks, and using your normal method check you can put more water in the boiler and that in doing so the pressure falls. Now turn down the Gas and watch the pressure gauge; record the pressure when the Safety Valve closes. Complete the record sheet and that’s it, job done ’till next year. 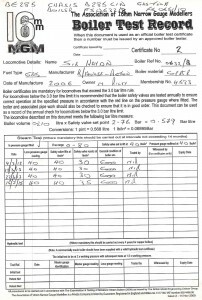 Finally keep your record sheet safe along with the original manufacturer’s Boiler Certificate: you may be asked to produce them at some railway open days.